The island of Tubabao, off the coast of Guiuan in Eastern Samar was one of the first areas in the Philippines to be hit by super Typhoon Haiyan. While the tiny island is only a 20-minute boat ride from Guiuan, many farming families living here have received minimal assistance owing to the difficulty in transporting materials to these locations. In the aftermath of Haiyan, Region VIII lost about 33 million coconut stands, affecting the livelihood of more than one million small-scale coconut farmers. Because newly planted coconut trees take six to eight years to reach productivity, there was a serious need to provide alternative forms of livelihood and address food security issues. Replanting coconut trees was therefore not sufficient; and interventions called for providing other sources of food and income and strengthening resiliencies against the onset of future disasters. 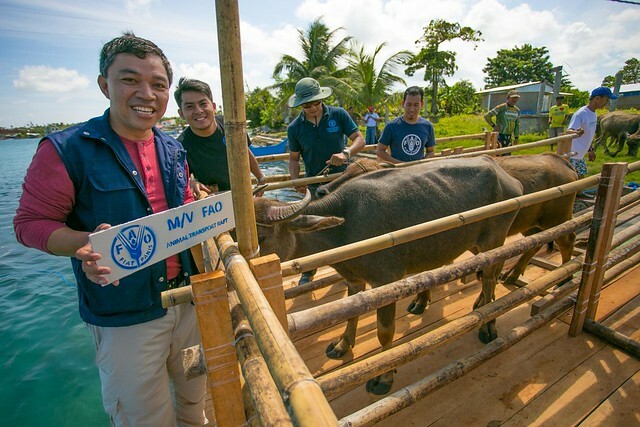 As part of its Haiyan Recovery and Rehabilitation Programme to support coconut farmers, FAO delivered more than 9 000 livestock to typhoon-affected farmers including carabaos, cows, goats and pigs. Livestock rearing is an integrated activity of the economic structure at farm and barangay level and it largely contributes to food security, rural income and to the efficient use of the local natural resources. The distribution of livestock to islands off the coast of Eastern Samar were funded by the Government of Japan.